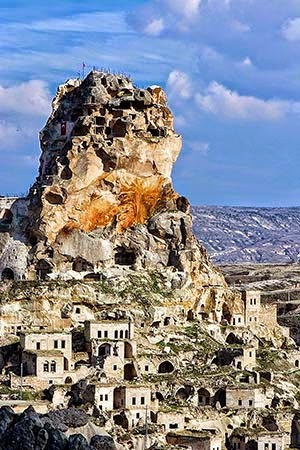 Soğanlı Valley offers the remains of fairy chimney dwellings and rock-cut churches with colourful frescoes. 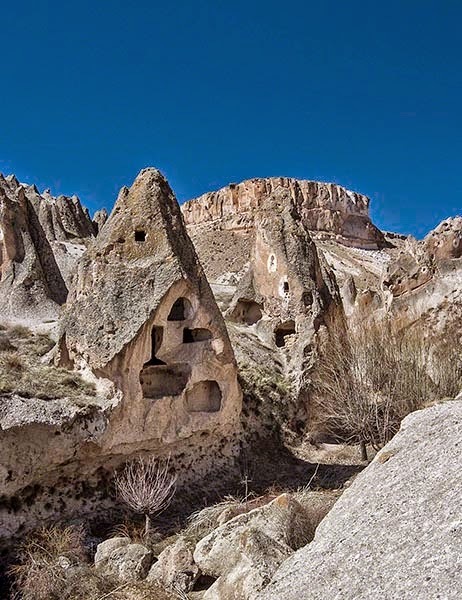 It is basically the same as Göreme Open Air Museum but it was a very pleasant drive and walk in the countryside with very few tourists. 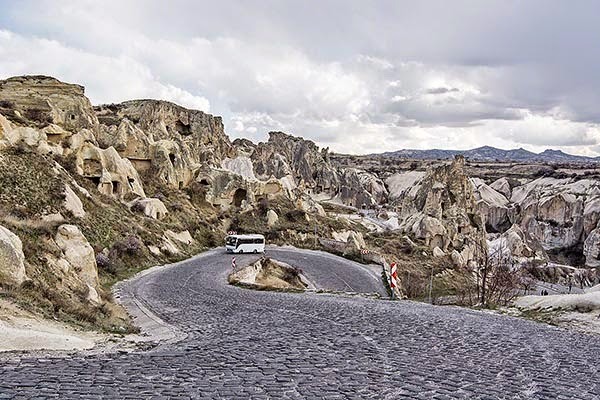 The drive south from Göreme to Soğanlı was 55 km, about one hour – photo stops not included! But there were a couple of surprises. 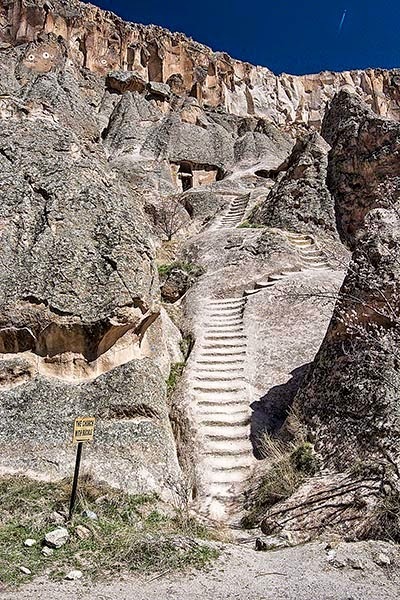 You can see the narrow area of Göreme Open Air Museum as the road switchbacks up the hill. 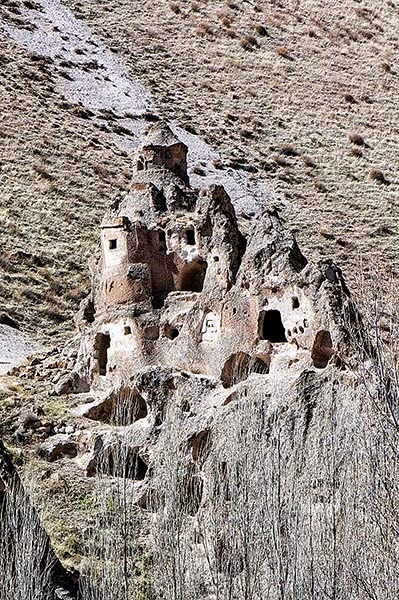 It is mainly rock cut churches rather than hoodoos. 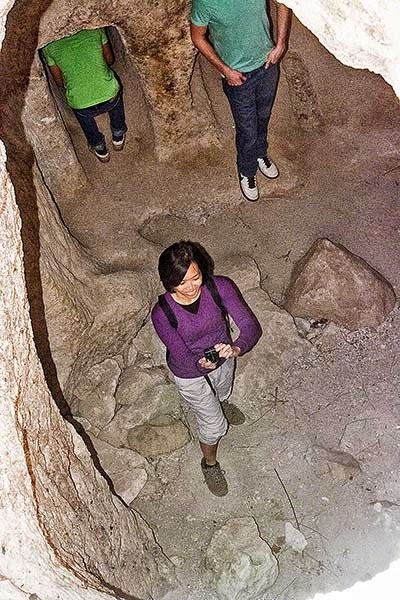 It may have the best-preserved frescoed churches, but it’s also always busy with large tour groups. 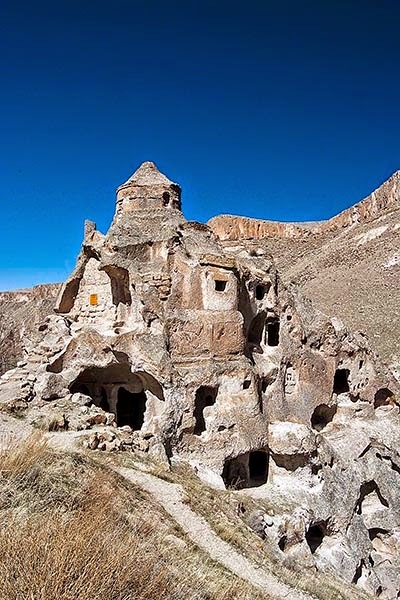 I boycotted the Göreme Open Air Museum as I am totally opposed to their charging twice: once for the park and once for the main sight, the Dark Church. What do you think about this common practice in Turkey? They also charge for parking. And you are not allowed to photograph the frescoes. 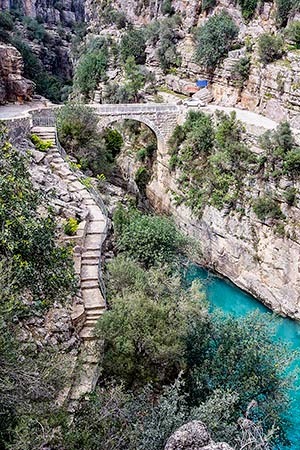 Instead of the Open Air Museum, we headed south via Ürgüp to Soğanlı Valley. 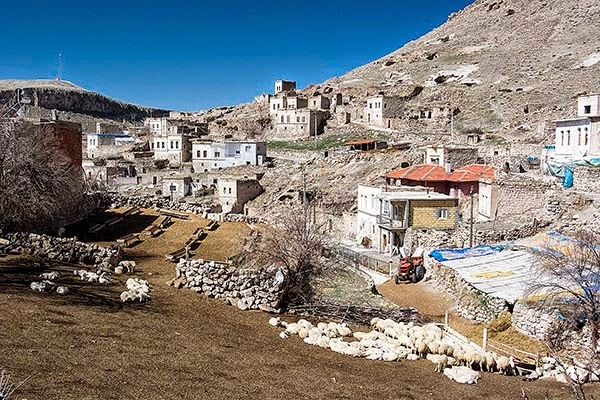 The drive from Ürgüp passes through Mustafapaşa, worth a stop as discussed in our last post. ﻿Well, we were treated to a BIG surprise half way into the trip. The road climbed up to 1550 m above sea level. There were sparsely treed fields with wide open views of snow-capped mountains in two directions, east and south. 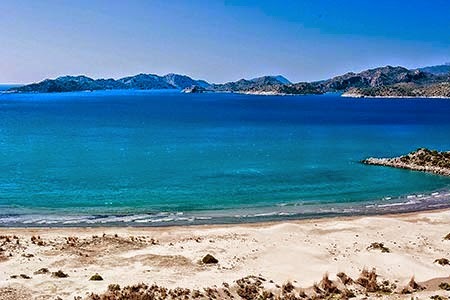 The pointy single peak is a former volcano that may have erupted as recently as 253 BC. 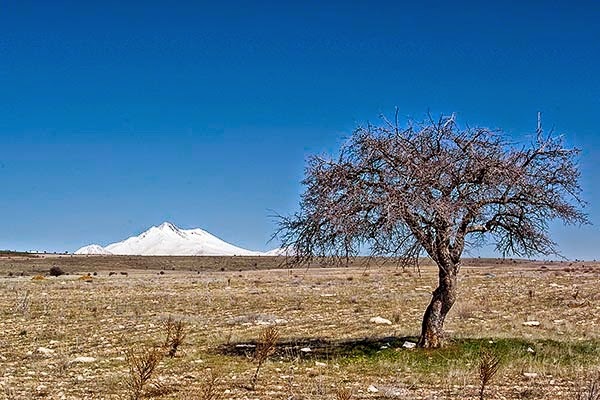 Mount Erciyes (Turkish: Erciyes Dağı) is located 25 km to the south of Kayseri. It felt closer because we were driving south and we were at 1550 meters so we had an unimpeded view. 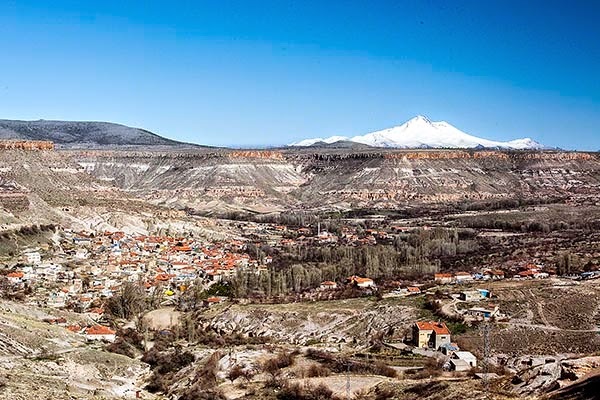 The fifth highest mountain in Turkey and the highest in Cappadocia at 3,916 meters (12,848 ft) always has snow at the top. 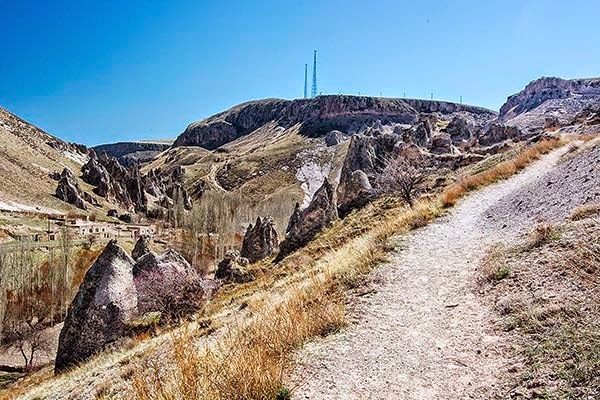 It started erupting at the same time as the Taurus Mountain uplifting that reduced rainfall in Cappadocia and contributed to the formation of the Cappadocia Fairy Chimneys. 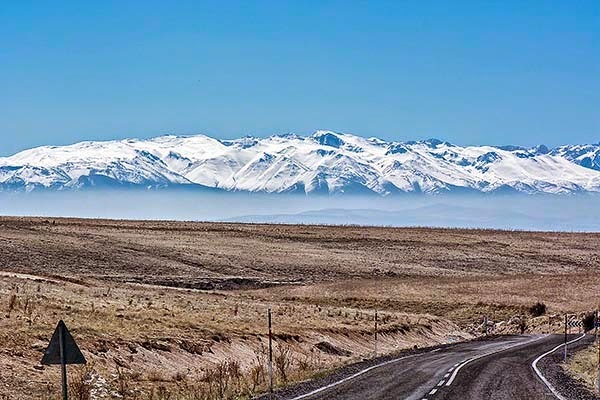 ﻿The longer snowy range to the south is Aladaglar Milli Parki (national park). 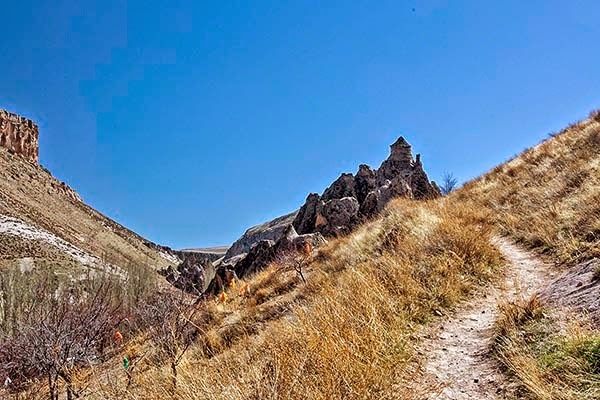 The highest peak, Demirkazik (3,756 m, 12,323 ft) is a prime birding site. 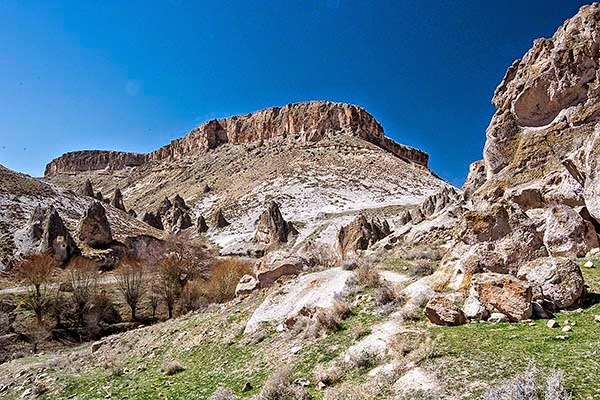 It is another dramatic view of the Taurus Mountain range that we crossed on the drive to Göreme. The road continues on to picturesque villages where we took more photos. 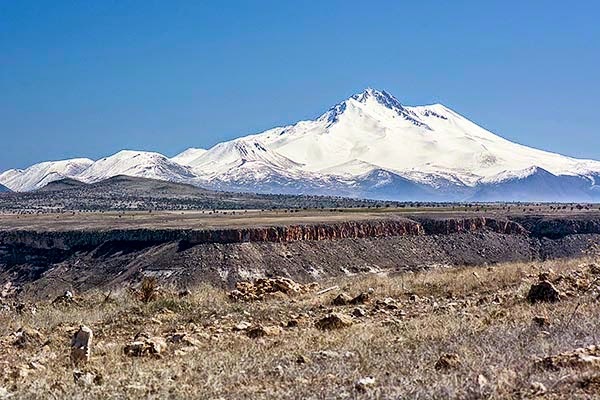 Actually this picture was taken on the return trip as Taşkınpaşa was more photogenic as you drive into the view with Mount Erciyes in the background. 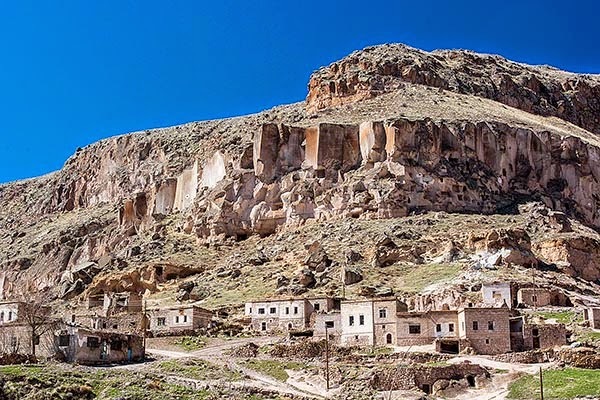 Şahinefendi had idyllic sheep and stone houses in the foreground with rusty cliffs in the background. You should see the following rock cut churches, which are well sign posted. A very crude map is given to you at the toll house. The Tokalı Kilise (Buckle Church) is sign posted on the right before you reach the toll house. It is up a uneven, steep stairway cut into the rock. 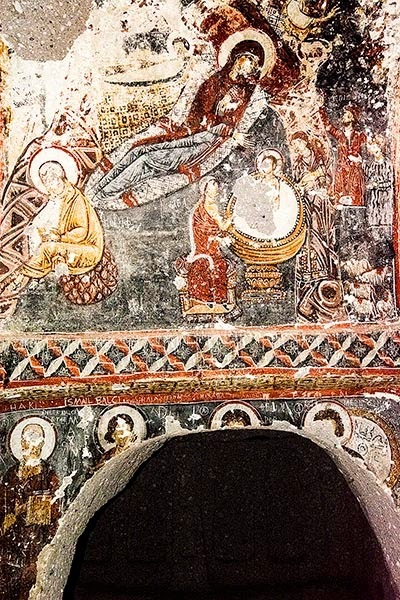 There was not much to see inside most of the Soğanlı churches as many of the frescoes have deteriorated and the lighting was poor. In fact, you get a much better impression looking at the photos below after they have been brightened up in Photoshop. Along the road you will also see dovecotes where monks collected guano from pigeons. After the toll house turn left towards the village restaurant. 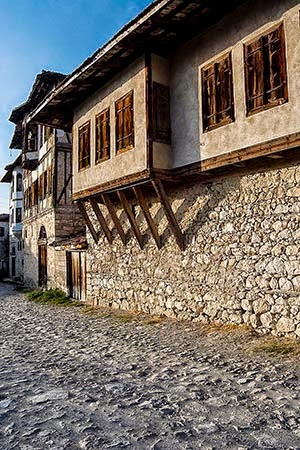 Take a path to Tahtali Kilise (Church of Doves or of Santa Barbara), which dates from the fifth century. 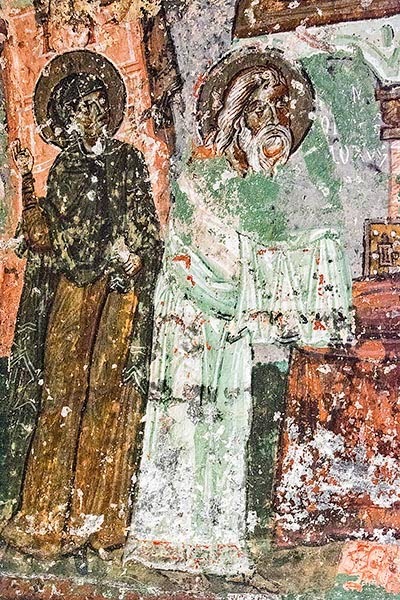 It contains some of the better frescoes of apostles and saints. 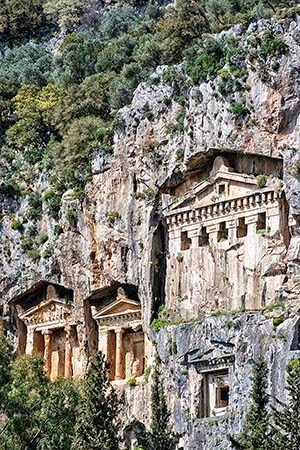 While some web sites say that this region was settled in Roman times, these rock-cut churches were from Byzantine times. Turn left to continue to the end of the main road where there is an open air restaurant. From here on you have to walk. 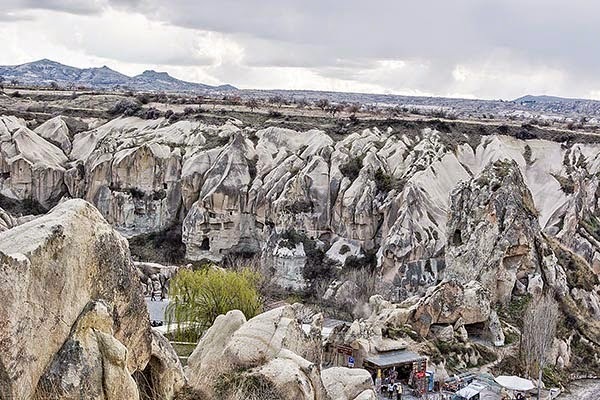 It is probably what the Göreme Open Air Museum was like many years ago. 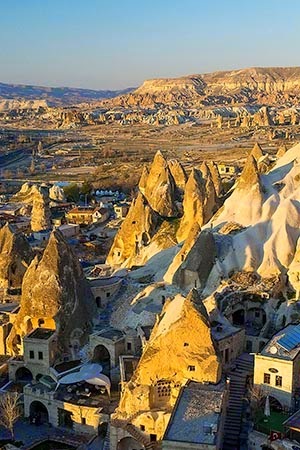 The first thing you see are fairy chimneys with cave dwellings. You first walk down and then up the trail on the right. The vertical basalt rock columns are a result of volcanic activity. In fact the rapid cooling of lava extruded near the surface. Basalt is usually grey to black in colour, but soon appears rusty red. That’s because it is rust - it contains iron-rich minerals. 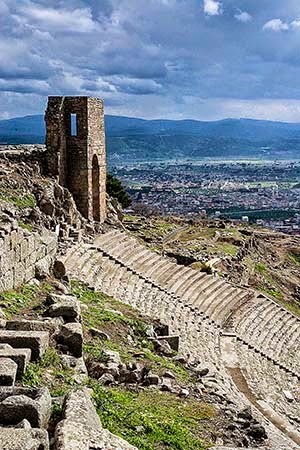 Karabaş Kilise (Big Church) dates from the sixth century but was rebuilt in the 11th century. It is considered the most beautiful from an artistic viewpoint. 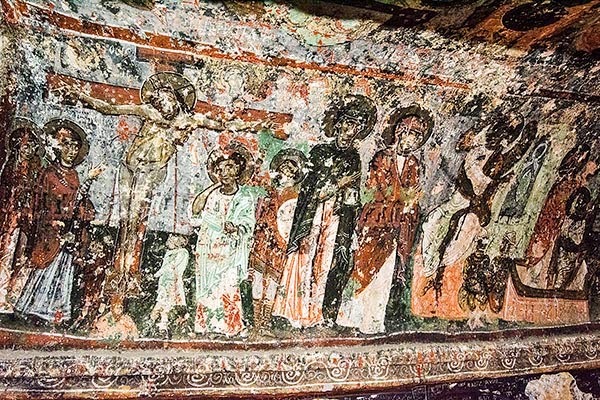 It contains frescoes of Christ and black-faced saints as well as Byzantine and Turkish motifs. The hike to the Kubbeli Kilise (Domed Church) starts to the left of the restaurant parking lot. It is a very short – maybe 20 minutes – so anyone can do it. You'll be rewarded by wide open views of formations and tranquility. 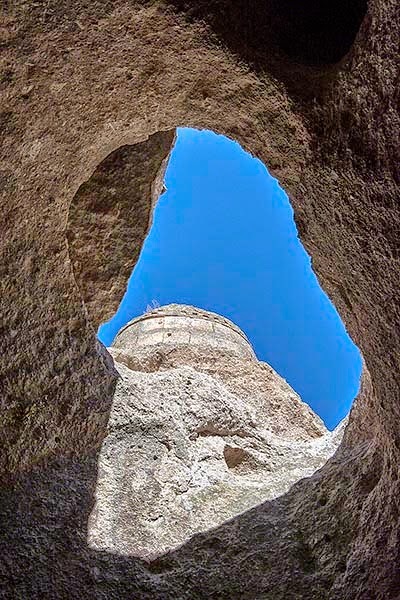 The Domed Church was carved into a fairy chimney. In fact, as we drove into the valley we thought we saw a miniature fairy tale castle -- see photo at the top. Wrong! It was the Domed Church. 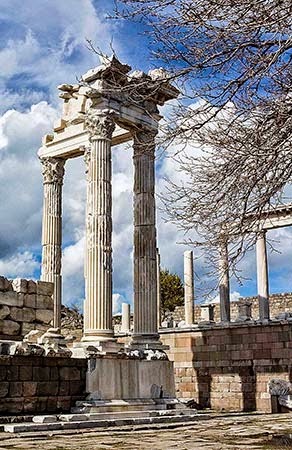 Next to Kubbeli is the Saklı Kilise (Hidden Church) and it is truly hidden - under the ground. Fortunately, there was a tour group just ahead that gave away the location of the hidden, steep stairs that led down the hill to the entrance. Through the gap in the ceiling appeared the Kubbeli dome.